Many teachers hate teaching poetry because they don’t know where to begin. 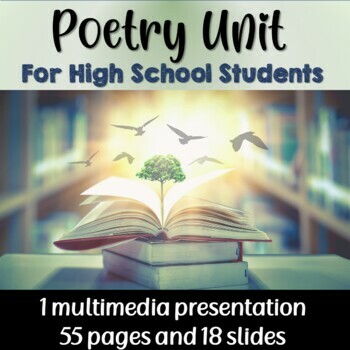 This unit will make you and your students love poetry. This complete, no prep unit is an excellent way to start! This 2 and a half week unit includes a student guide, 12 detailed lesson plans, two multimedia presentations (no internet connection required), a complete answer key with annotated poems, and an end of the unit evaluation with answer key.